After the abysmal X-Men 3 and the enjoyable, but forgettable Wolverine. I’ll admit that I was skepticle about another trip to the X-Men well. I was wrong, X-Men:First Class is brilliant. The movie starts, where the first X-Men film started, in 1944, with a young Erik, in a Nazi concentration camp. Erik’s power is spotted by Dr. Schmidt (Kevin Bacon) who pushes Erik in to unleashing his powers, in a brutal way. At the same time a young Charles Xavier finds young Raven/Mystique, in his kitchen, disguised as his mum stealing food and the two become friends. The movie then moves to 1962, where Charles (James McAvoy), with the help of CIA agents, starts to search out other mutants. It’s during a mission, that they find Erick (Michael Fassbenner-next James Bond,surely?) who is still hunting Schmidt, who now is a wealthy man named Sebastian Shaw. Shaw is organising his own group of mutants, to rise up against the humans. The acting is great, but the film suffers slightly from having so many characters. Any film with a large cast, is going to struggle to give each character the screen time, he/she deserves. 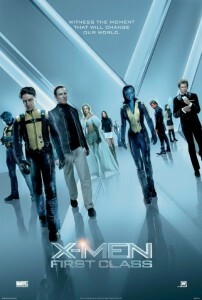 Some of the mutants featured are Angel, Azreal, Banshee, Beast, Emma Frost, Darwin, Havok, and Riptide. Even Hugh Jackman makes a cameo appearance as Wolverine. There are some continuity issues, Xavier is left wheelchair bound in this, yet in the flashback opening to X-Men 3, an older Xavier is walking, unaided. Also, in the 80’s set Wolverine, there is a teenage Emma Frost. Yet in the 60’s set First Class, Emma Frost is a fully grown adult. Which, bring us on to the only major flaw in this film, Janurary Jones. She is awful. She looks bored, she looks hungry. Maybe we would have gotten a better performance if someone on set, had just bought her a sandwich.Special mention however must go to Nicholas Holt. He is amazing as Hank McCoy/Beast. His American accent even sounds natural. Overall, I enjoyed this film and I would welcome another X-Men story, with this cast.